Finish his alphabet wall. I already purchased the letters from ETSY and they plain birch wood. We planned on having them painted at the baby shower that never happened, and I just haven’t had a chance to paint them. They will go above the recliner. As soon as things ‘settle down’ I’ll get that done. I need to clean out his crib, but he’s currently sleeping next to us in his Rock n’ Play– So that’s not such a big deal at the moment. His great grandmother bought him a moses basket, but unfortunately he can’t lay flat most of the time, so we took some pictures of him in it and plan on giving it away soon. I also plan to get a bookshelf of some sort. I had wanted one from IKEA, but it is much too large for his room right now. Maybe once we outgrow the need for his rocker/recliner I can put one in it’s place. This sign is hung on his nursery door. 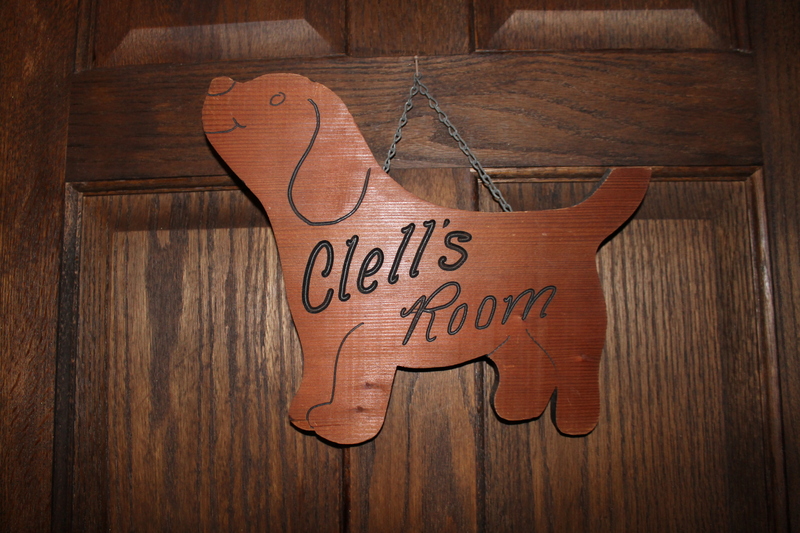 My son is named after my husband, and this sign was my husbands from when he was a boy. I love how many things we have from when my husband was a baby. This just adds an extra special touch to the room. This is the view from the hallway into my son’s room. 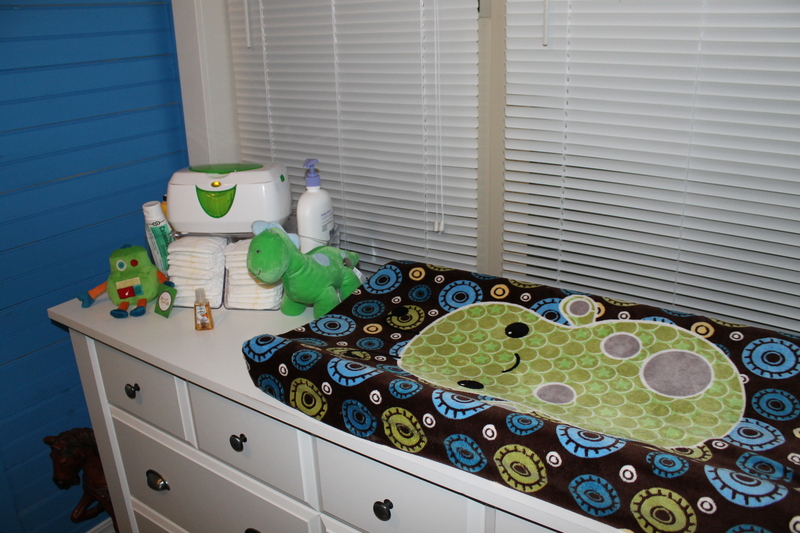 His theme is ‘peek-a-boo monsters’– Blue, Brown, and Green. 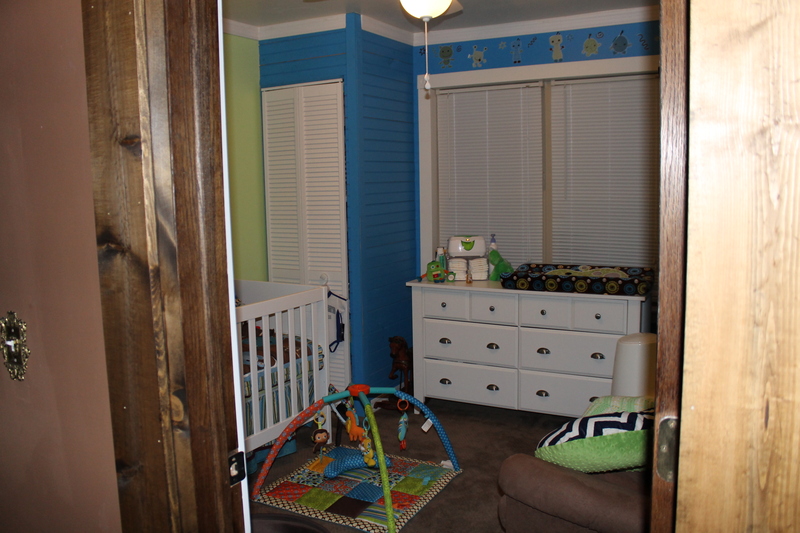 The dresser slash changing table is positioned between two small closets and directly in front of his window. There is a small antique rocking horse to the left. 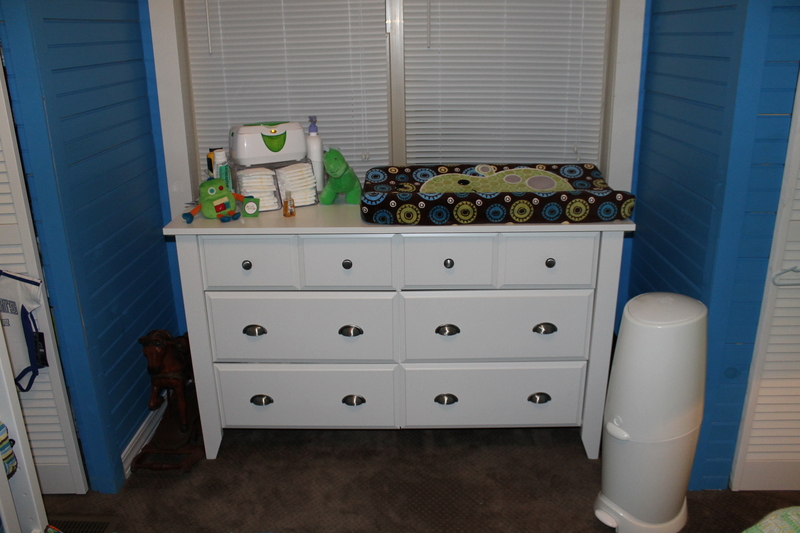 It used to be where the diaper genie is, but we’re pressed for space so I had to put it there. 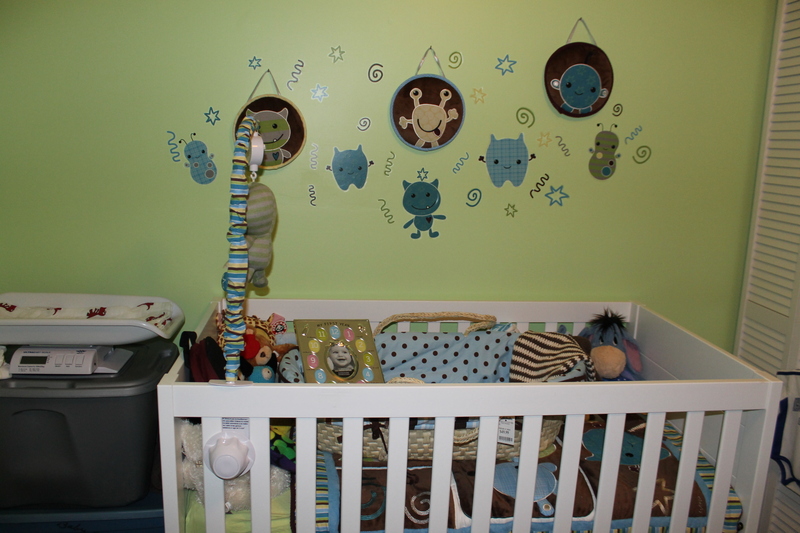 A close up of our changing area. We were given the changing pad cover as a gift. I use a diaper changing station and a wipe warmer. The sides hold some up and up lotion, diaper cream, and baby powder. The little robot plush is from a friend, and the dinosaur was from my mom. It plays music and baby boy loves it. I also keep hand sanitizer handy. The first two drawers. The left hand side is all of the misc. things everyone collects. 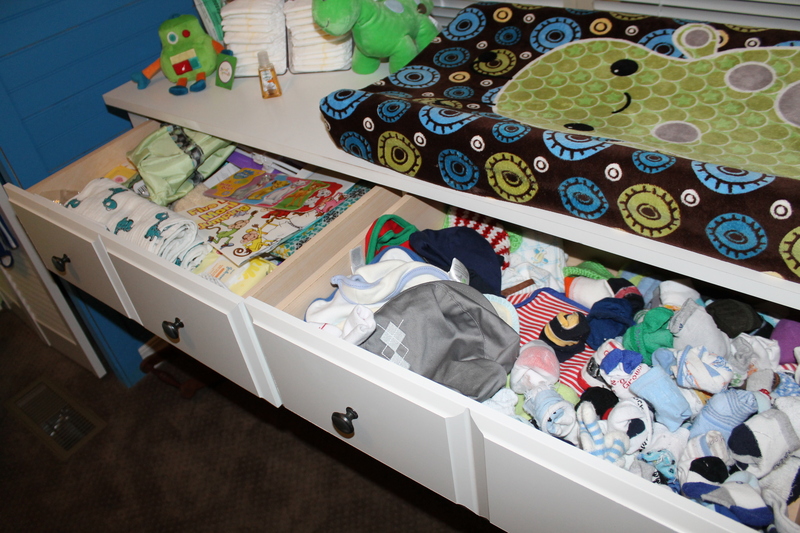 The right hand side holds socks, bibs, hats, and burp cloths. I need to get some of those IKEA drawer organizers badly, but the nearest IKEA is 2.5 hours away. We had planned a trip there before he made his appearance, but his early arrival derailed those plans. The second row. 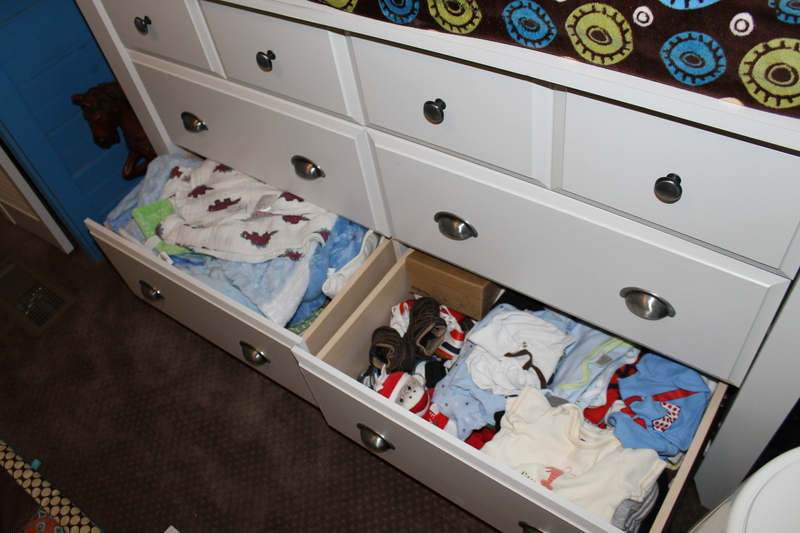 The left drawer has his outfits that he currently fits into, and the right drawer has his sleepers that he currently fits. The last row. 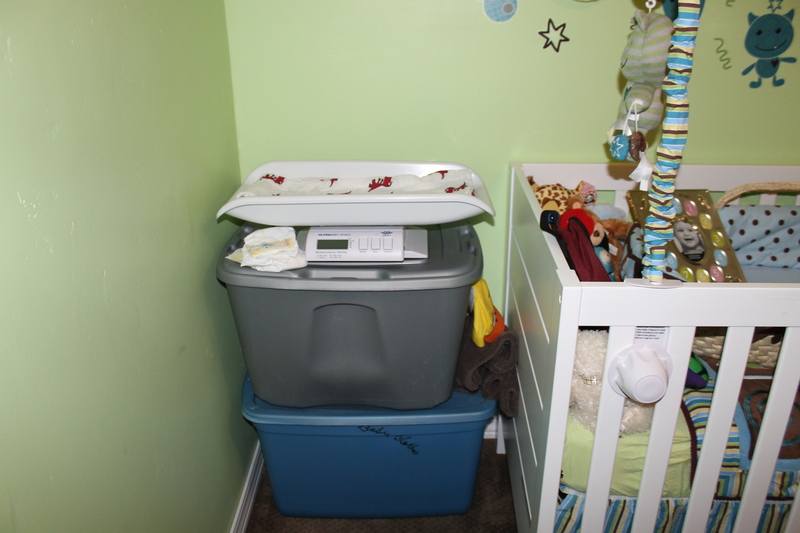 Left side has extra blankets, sheets, changing pad covers, etc. The right side has his onesies, and shoes. 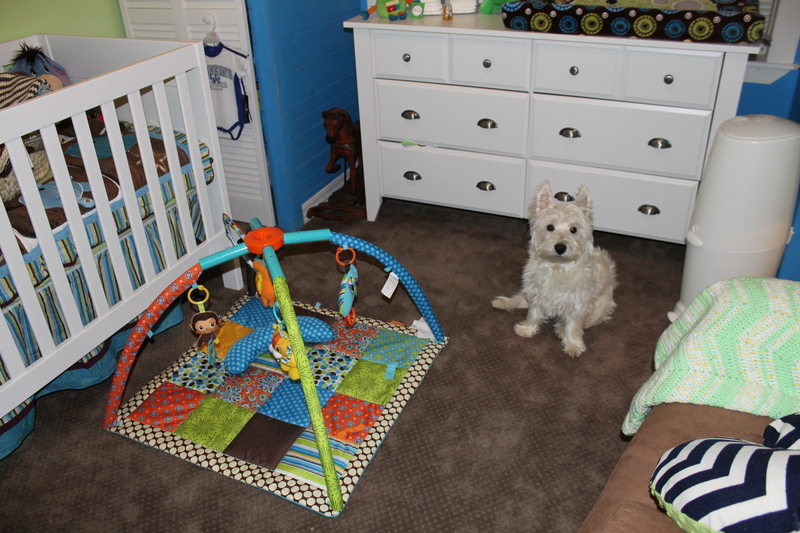 Here is his crib. He’s not sleeping in it right now so don’t stress about all of the things inside of it. We’ve got all of his stuffed animals, and a moses basket that my husband’s grandma gave us. *Our son can’t sleep flat, so we took some pictures of him in it and we’re looking to give it away. The right side you can see his closet door. Opposite of the crib is the rocker. 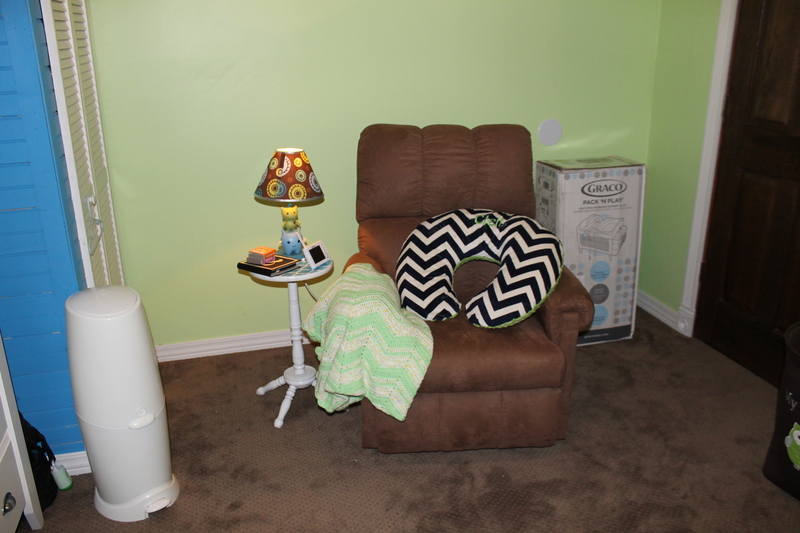 It’s a lazyboy recliner and it’s super comfortable. The table is something my mother in law found at a flea market. The afghan was made by his grandmother, and we love to cuddle with his boppy pillow and blanket and relax. I’ve got the video monitor on the table, because currently our son sleeps with us. So if he’s laying down while I’m folding clothes or something I’ve got easy access to it. The lamp is part of his theme. 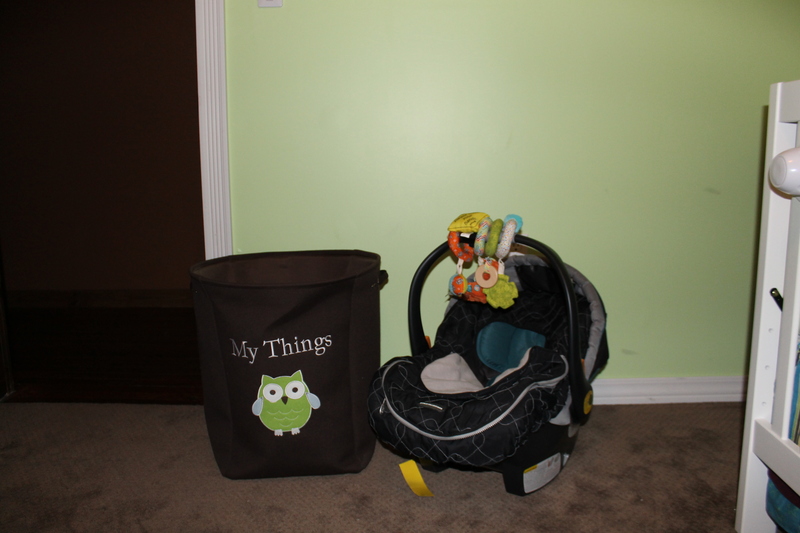 In the background we’ve got the packn’play/changing area/basinet that we don’t need, so I’m giving it away as a baby shower gift. I just need to wrap it. 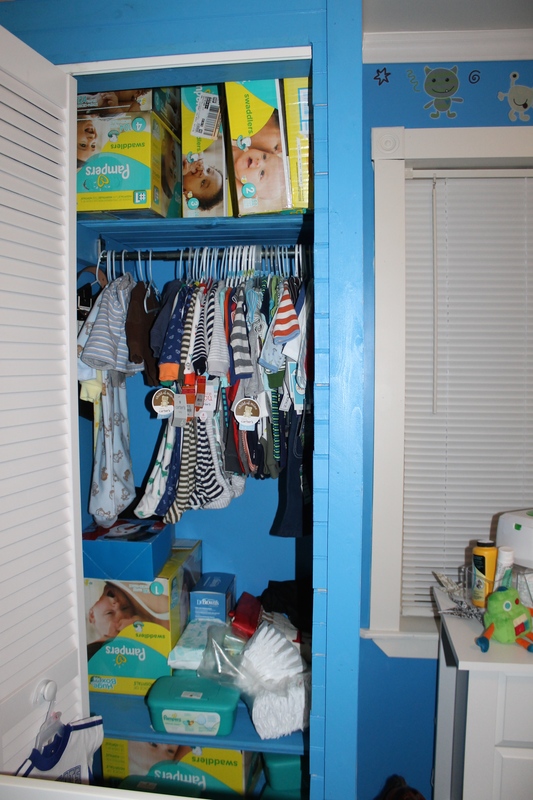 This is the closet where I have his extra diapers, wipes, and his next size up in clothes. 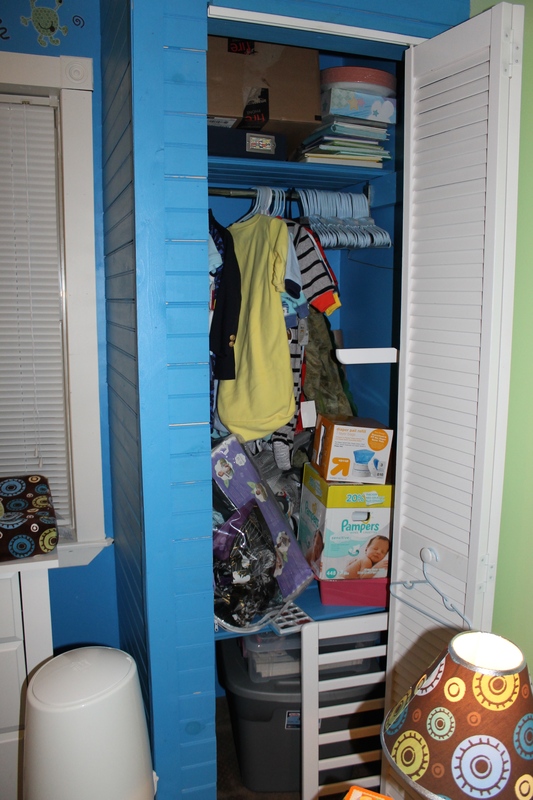 This closet has a little bit of everything. Mostly things we won’t need for a long time. 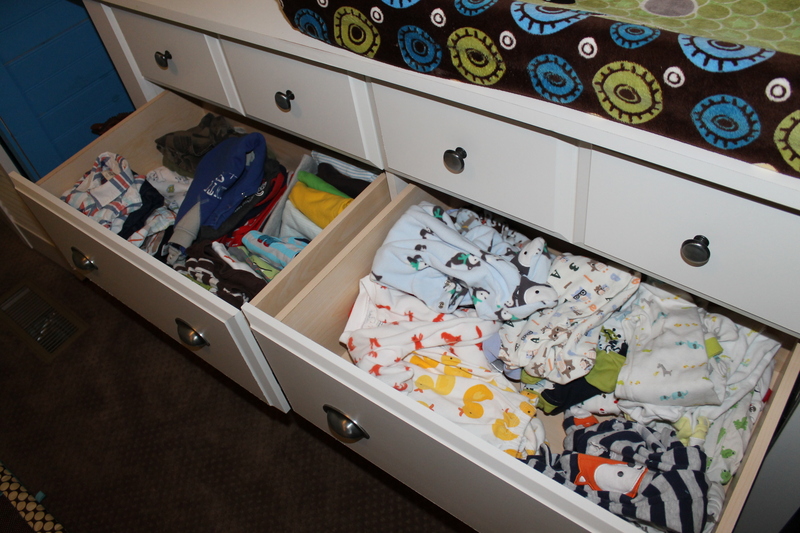 His toddler bed rail, his 6-12 month clothes, and a lot of other odds and ends are in here. I’ll organize it eventually. This is where I plan to put his bookshelf eventually. The ‘basket’ is currently being used as a dirty clothes hamper, but will eventually house his toys. And his carseat. Just another shot of the room, and our dog. It’s a small space, but we’re making it work. *I leave the floor mat out because we use it daily. He absolutely loves it!